A half-day workshop to explore how nature camp and environmental issues could be better incorporated within the National Education System in Nepal took place 4 July 2016. The event was hosted by the International Centre for Integrated Mountain Development (ICIMOD) in partnership with the Curriculum Development Centre (CDC) under Ministry of Education (MoE), Government of Nepal. Under the guidance of Bishwa Prakash Pandit, Secretary of Ministry of Education, the consultative workshop had the following objectives: to give continuity to the pilot camp and upscale the initiative to the national level; to solicit actions for integration of the camp concept into the national curriculum; to engage various stakeholders in making the National Nature Camp Initiative (NNCI), a collaborative endeavour; and to develop an action plan for suggested actions. 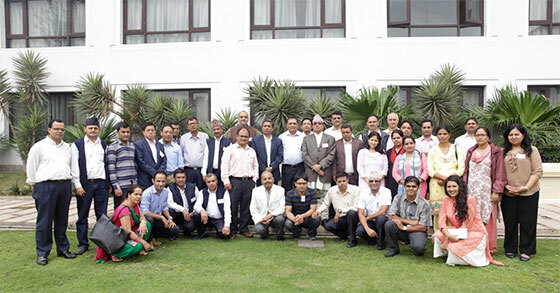 Forty representatives from MoE, Ministry of Forest and Soil Conservation (MoFSC),CDC, National Centre for Education Development (NCED), Department of Education, Non-formal Education Centre (NFEC), World Wildlife Fund Nepal (WWF), Friends of Zoo, Environmental Camps for Conservation Awareness (ECCA) and ICIMOD participated. During his opening remarks, Babu Ram Poudel, Executive Director of CDC highlighted the importance of investing and empowering future generations. Mr Poudel extended support on behalf of the MoE to ICIMOD’s Nature Camp Initiative and further collaboration. Eklabya Sharma, ICIMOD’s Director of Programme Operations underscored the importance of investing in youth and promoting the knowledge of mountain environment. 'This will be a more systematic and institutional approach to bring awareness about the need for nature conservation in school-going students, which is the best way for learning for life’, Dr Sharma said. Bishwa Prakash Pandit, Secretary of MoE, suggested the mobilisation of available resources along with existing curriculum could be integrated through proper research and gap analysis. Brij M.S. Rathore, ICIMOD’s Chief Policy Adviser said nature camp could be an effective tool to promote environmental stewardship and leadership in early-age school children. A detailed presentation on ICIMOD’s REDD+ Initiative and pilot nature camp was given by Bhaskar Karky and Trishna Singh Bhandari followed by presentations on the current environment school curriculum. Panel discussions were held and recommendations were made to take the initiative forward. Creating a network to connect ministries and departments of government in designing curriculum, and sensitising the school management committee about the importance of nature camp through trainings, were some of the recommendations of the panelists. Jaya Prasad Acharya, Deputy Director of CDC, suggested the formation of a technical committee to address logistical and social issues; to implement and monitor curriculum; to develop an action plan; to promote the use of the practice in the curriculum.